Inquiry Based Maths Assignment; Open a Store - Extend learning of decimals (into the hundredths) and simple percentages (50% and 10%) with links to the real world. Grades 3-5. 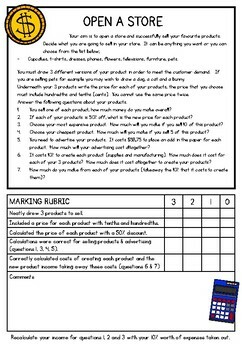 Enrich and extend your students' understanding of decimals (into the hundredths) and simple percentages (50% and 10%) with this simple but effective open a store project. Students link their learning to real life by creating 3 products to sell and calculating the income and costs of these products by assigning a price for each with tenths and hundredths. Perfect as an extension for those early finisher or just as an assignment at the end of a decimals and percentages unit. This worked beautifully for my more advanced students who needed a deeper learning of decimals, percentages and basic operations.